Dubai’s property market had shown some positive growth in 2011 that may allow it to overcome the prevailing headwinds in 2012. The Real Estate Regulatory Authority (RERA) of Dubai said in a report that a 20% increase in property transactions worth AED 143 billion has been recorded by end-2011. The said growth could be attributed to land acquisitions valued at AED94bn. 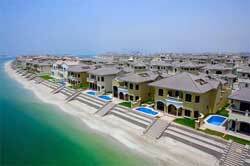 Purchases of flats and villas amounted to AED48bn and AED6bn, respectively. Buyers in Dubai, according to RERA, are mostly from the UK, India, Pakistan, and the UAE. Dubai-based real estate agency Edwards and Towers said in a related report that some affluent buyers from Iran had recently flocked to Dubai, with the recent international sanctions imposed on their home country. The Iranian buyers, said Edward and Towers have acquired villas that are no less than $4 million. Dubai authorities are bullish that investors have regained their confidence and have returned to the market. “We can expect 2012 to show the same increase or stay at the same level. We are marketing the real estate environment as transparent and secure,” Mr. Marwan bin Ghalaita, CEO of RERA, said in a press conference on Wednesday. CBRE Richard Ellis shares this observation by the RERA. The property research firm said in a report that Dubai’s residential property sector will continue to draw investors’ interest preferring the established community projects offering superior facilities and amenities. In terms of rentals, a related report by CBRE Richard Ellis said apartment leases were overtaken by rentals of villas. In 2011, the price decline of these rental properties was not as steep as that of 2010. The CBRE report said the 8% drop noted on apartment rental rates is better than 17% recorded in 2010. CBRE said the main issue of oversupply remains with consumers still scrimp on demand.